If you’ve been reading our blog since the beginning (just a month ago! 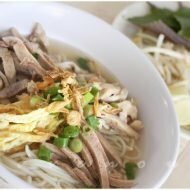 ), we’ve been building upon different recipes to create our favorite traditional Vietnamese dishes. Bun Cha Hanoi is another great way to use a varietion of what we’ve already made (thit nuong, a variation of nem nuong, and picked carrots and daikon). 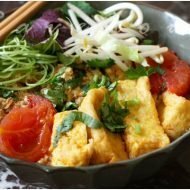 As the name implies, this dish originates from the city of Hanoi in northern Vietnam, but is very popular throughout the country. 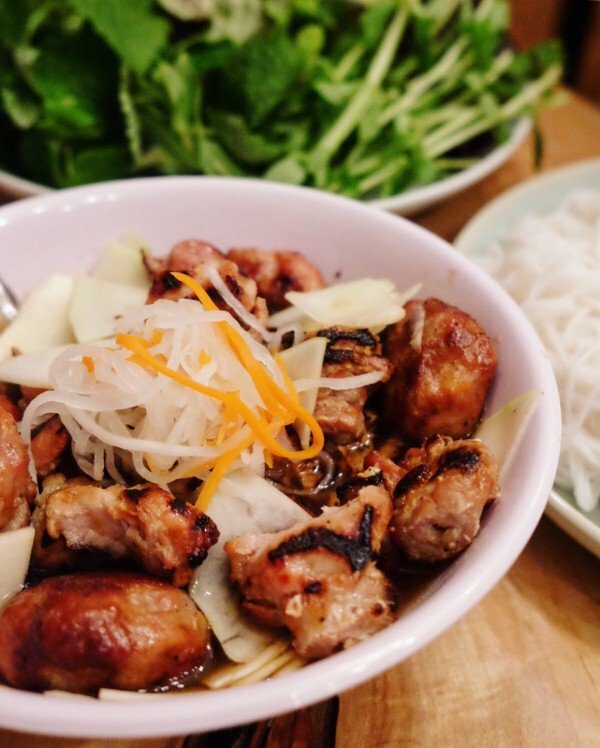 It is similar to Bun Thit Nuong, in that both vermicelli and grilled pork are used, however the difference is that it includes a cha (pork sausage patties) and both grilled meats are soaked in nuoc mam cham, allowing it to soak up all the flavors of the nuoc mam. The cha nuong in this dish is slightly different then nem nuong in that there’s no garlic. 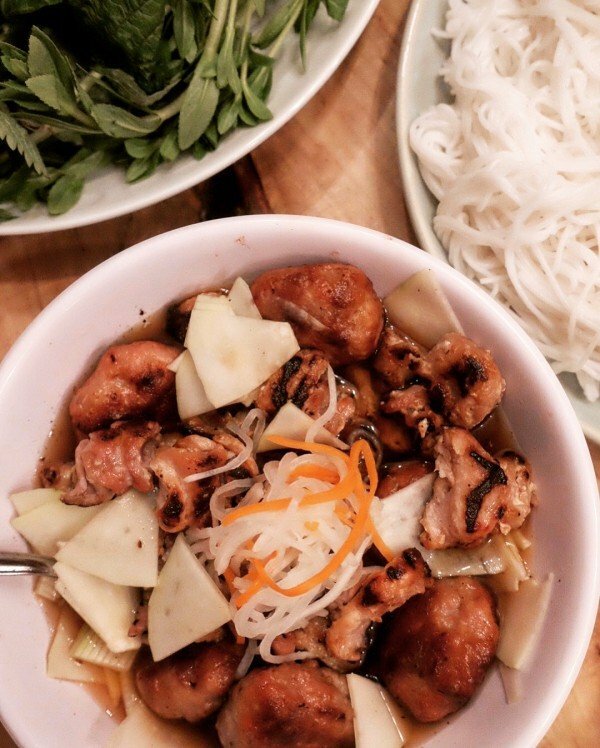 Serve the dish with grilled meats and pickled vegetables as well as pickled green papaya in a separate serving bowl and allow guests to spoon on the savory goodness of Bun Cha Hanoi over vermicelli and fresh herbs. When meats are done, place in a covered medium sized sauce pan containing the nuoc mam cham and pickled vegetables. The juices of the meat will darken and meld with the fish sauce. Allow to soak for at least 5 minutes until service. Serve family style with vermicelli and fresh herbs and vegetables. Make sure you start with warm or room temperature nuoc cham so that it does not cool down the meats. Vermicelli rice noodles, cook according to directions. Combine pork patty ingredients in mixing bowl and mix well. In a separate small bowl combine the slurry and add to meat mixture and mix well. Keep meat mixture in the fridge for about 1/2 hr to let it set and easier to handle when forming patties. Form patties, in small disks about 2 inches wide and 1 inch thick. Set aside. Combine ingredients for the pork skewers at least 1/2 hr. Skewer onto bamboo skewers or use a grill mesh basket. Quick pickle the papaya by dissolving the salt and sugar in vinegar and add the papaya and set aside. Grill both patties on medium heat to get nice char. 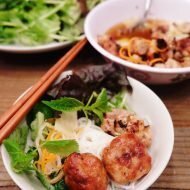 Remove the pork from the skewers and place along with the patties into a big bowl of nuoc mam cham. Add the green papaya and serve with vermicelli and herbs. Your recipes always look so delicious. Great photos! Thanks for commenting on my blog, I linked my blog to yours. SHRIMP! What a great addition. amazing blog site! The recipes make me salivate instantly – especially just by looking at the pictures. You really know your photography. Keep up the good work. ok. confession: i'm *sure* i've had this dish before, growing up in a vietnamese household, i must've. however, i don't always know the names of the dishes… FF to present day, recently at a local viet restaurant, my roommate ordered this dish. the menu did not give a description and she asked me what the dish entailed. I HAD NO IDEA! i should've been embarassed but i was more amused that a spanish girl was venturing into uncharted territory. she has requested that i make this soon, and with your recipe handy, i'll be able to now. thank you for posting it. Bun cha hanoi is one of my favorite dishes! I've been ordering this dish a lot when I go to Brodard. What a great post – I can't wait to try out this recipe and impress my parents, lol. Cookin Canuck: Thanks so much! Cam: Thanks for the link! We'll link back to yours. bnto_2002: Thanks and visit again! Angry Asian: Let us know if you guys do and post soon! Food Addicts: Krissy, that's alot of pressure! I'm sure it'll be great! Hi! 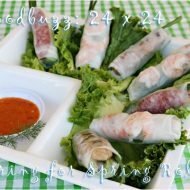 glad I came accross your site, was looking to see how others do the nuoc nam! Any how, thanks for posting, I've subscribed. Come by an visit me sometime. Happy New Year! 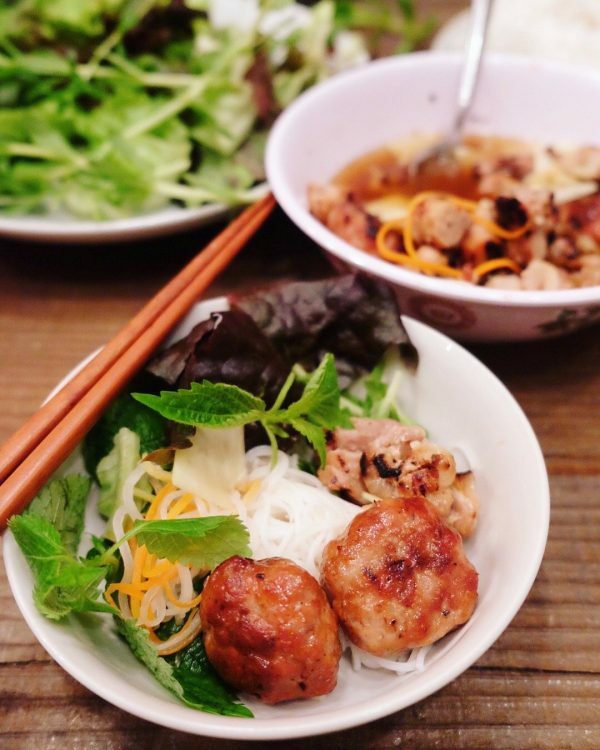 Bun cha is one of my favorite things to eat in Ha Noi. I've never had it with shrimps…interesting add. Your cooking looks delish! This looks amazing! On the hunt for caramel sauce! if you can’t find it, it’s easy to make your own. melt 2 tbs of sugar, stir until caramelized, being careful not to burn, and thats it! yes, of course and we mentioned that normally there is no shrimp. we just threw it in there just because great idea with five spice! I had this in Hanoi last year , best food i’ve had for ages .